Supporters gather to pay tribute at Leicester City Foootbal Club. 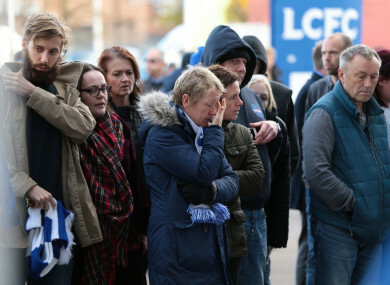 FANS LAID DOWN hundreds of football scarves, shirts and flowers outside Leicester City’s stadium on Sunday, a day after the club’s Thai billionaire owner died in a helicopter crash just outside the ground. Among the sea of tributes to Vichai Srivaddhanaprabha — the funder behind the club’s epic 2016 Premier League victory — was also an image of Ganesh, a Hindu god often seen at Thai Buddhist temples. As emergency vehicles passed back and forth from the scene of the crash, a steady stream of people came to express their gratitude: a man on crutches, a father consoling his teenage son, a woman carrying a bouquet of blue and white flowers — the colours of the football club. “He’s put Leicester on the map. He’s made us big, we’re not just a little club anymore,” said one supporter, 55-year-old Cathy Dann, speaking before Srivaddhanaprabha’s death was confirmed. John Welford, 68, said: “What a fantastic man! I’ve been a supporter 60 years and personally I think he’s the best ever owner we’ve ever had”. Fans streamed to the stadium to express their gratitude long before official confirmation that the 60-year-old businessman, who frequently flies to and from Leicester’s home games by helicopter, was aboard the aircraft. Many also remembered the owner’s generosity to fans — free breakfasts at away matches and free beers on his birthday — as well as to the city, including a donation to the local hospital. “They’re sort of around like supporters, they’re like us. They believe in what the club is and they’ve bought into that,” said Mahendra Mistri, 59. Kanti Patel, one of the first supporters to come to pay tribute in the early hours of Sunday, told AFP: “It means a lot to me, he did a lot for the club. Another fan, Tom Lievers, arrived with a “Champions” scarf to pay tribute to Vichai. Vichai also brought Thailand greater recognition in the international sporting world, developing the Southeast Asian country’s football scene. At a football game in central Bangkok, Leicester City fan Apichart Jitratkavee said he was an important person who “raised the bar of Thai football further. Another fan, Nathavut Sirimontaporn, said Vichai had brought “benefits” to Thai football. “I think having him as an owner of Leicester City made people know Thailand more,” he said. Email “'He made us champions': Leicester pays tribute to Thai owner”. Feedback on “'He made us champions': Leicester pays tribute to Thai owner”.